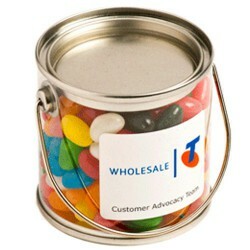 Promotional lollies in branded buckets and jars are quite ingenious marketing merchandise. 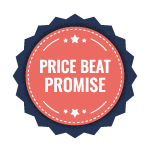 They are highly visible and can promote your brand in a subtle but effective manner. 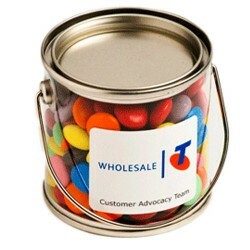 Promotional Product Experts offers plenty of custom printed buckets and jars filled with lollies including PVC buckets, glass jars, ring pull cans and noodle boxes. 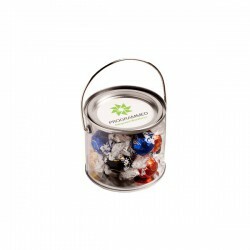 They can be filled up with an assortment of candies like M&M’s, mints, choc beans and promotional jelly beans, making them great holiday or party giveaways and gifts. 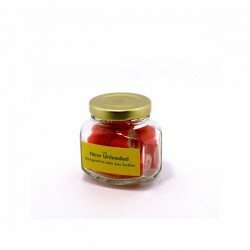 Personalised Rock Candy in Plastic Jar 135G. 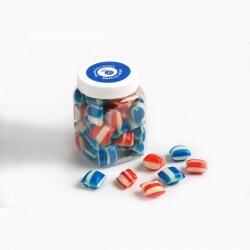 Corporate Coloured Humbugs in Glass Squexagonal Jar 80G. 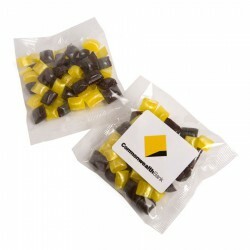 Rock Candy in Clip Lock 125G. 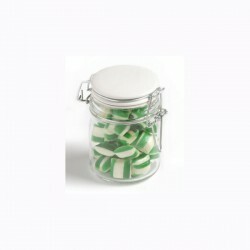 Corporate Coloured Humbugs in Glass Clip Lock Jar 160G. Rock Candy in Clip Lock Jar 65G. 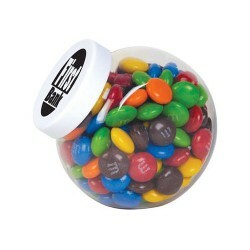 Corporate Coloured Humbugs in Glass Clip Lock Jar 80G. 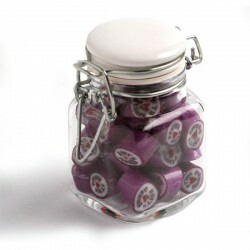 Personalised Rock Candy in Squexagonal Jar 65G. Corporate Coloured Humbugs in Plastic Jar 150G. 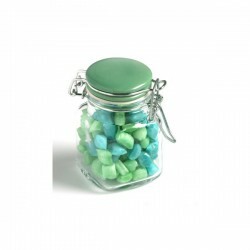 Rock Candy in Glass Tall Jar 150G. 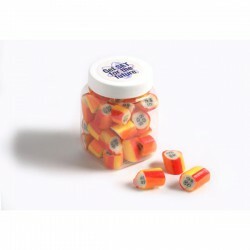 Corporate Coloured Humbugs in Glass Tall Jar 180G. 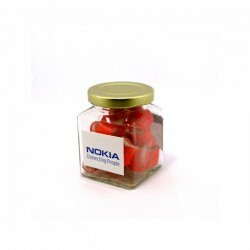 Personalised Rock Candy in Glass Square Jar. 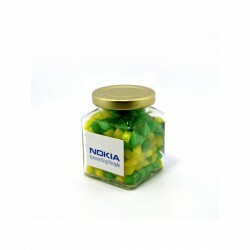 Corporate Coloured Humbugs in Glass Square Jar 140G. 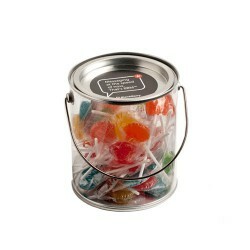 Big PVC Bucket Filled with Small Lollipops X50. 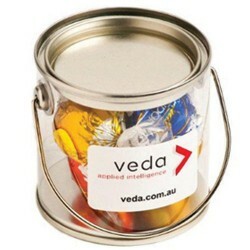 Big PVC Bucket Filled with Ball Lollipops X44 (Corporate Coloured Lolllipops). 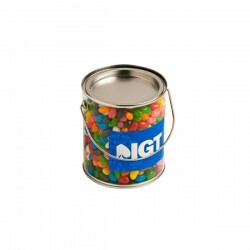 Medium PVC Bucket Filled with M&Ms 400G. 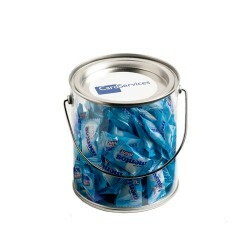 Medium PVC Bucket Filled with Mints 400G (Chewy Mints). 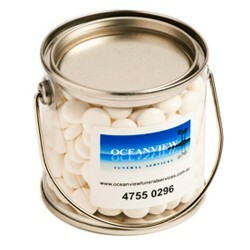 Medium PVC Bucket Filled with Mints 400G (Normal Mints). 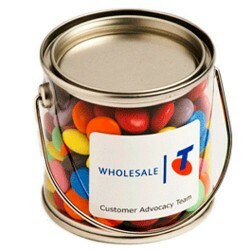 Medium PVC Bucket Filled with Choc Beans 400G (Corporate Colours). 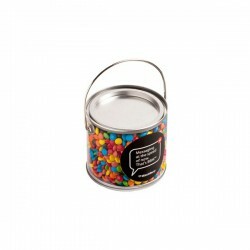 Medium PVC Bucket Filled with Choc Beans 400G (Mixed Coloured). Medium Bucket Filled with Jelly Beans 400G (Corp Coloured or Mixed Coloured Jelly Beans). 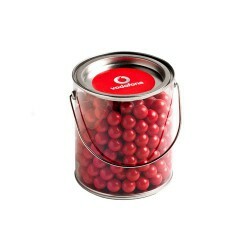 Small PVC Bucket Filled with Lindt Lindor Balls X5. Small PVC Bucket Filled with Orange Choc Drops (Jaffa Look Alike) 160G. 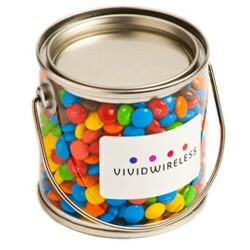 Small PVC Bucket Filled with Mini M&Ms 170G. 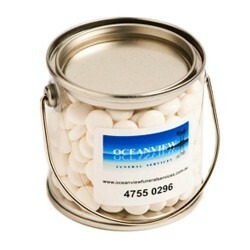 Small PVC Bucket Filled with Mints 170G (Chewy Mints). 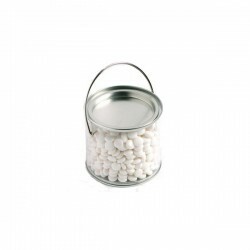 Small PVC Bucket Filled with Mints 170G (Normal Mints). 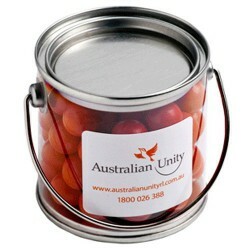 Small PVC Bucket Filled with Choc Beans 170G (Corporate Colours). 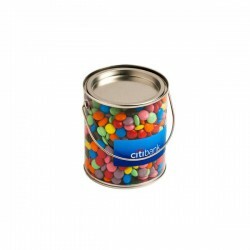 Small PVC Bucket Filled with Choc Beans 170G (Mixed Colours). Medium PVC Bucket Filled with Orange Choc Drops (Jaffa Look Alike) 420G. 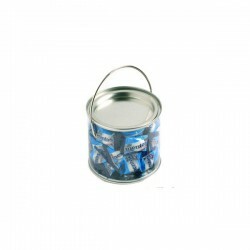 Medium PVC Bucket Filled with Mentos X 60 170G. Medium PVC Bucket Filled Mixed Eclairs 240G. 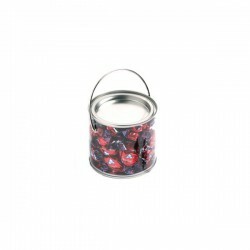 Big PVC Bucket Filled with Ball Lollipops X44 (Mixed Coloured Lollipops). Big PVC Bucket Filled with Chocolate Eclairs 450G. Clear dispenser with mini scoop. 850 grams of milk chocolates M&M's packed in 1 Litre Drum. 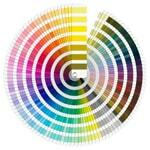 Assorted colours only. Finished weight - 990 grams. Allergen advisory label included. 145 grams of milk chocolate M&M's packed in Container. Finished weight - 180 grams. 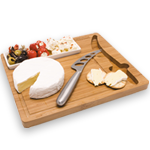 Allergen advisory label included. 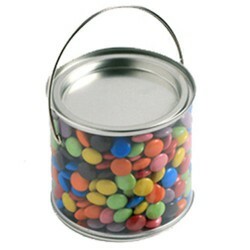 Ring pull can filled with 180g of M&M's packed in poly bag then can. Finished weight - 223g. Opaque large confectionery dispenser. 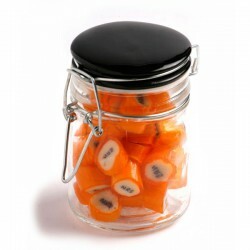 Great for Lollipops, Toffees or any wrapped confectionery. 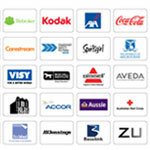 Supplied flat when unassembled. 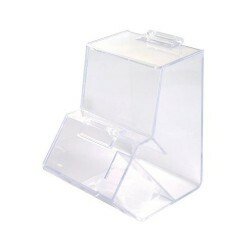 Clear mini confectionery dispenser. 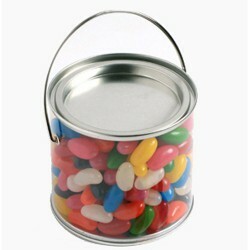 Great for jelly beans or m&m's. Supplied flat when unassembled.